Life Is Beautiful: have you done your part? Early this morning, I headed to precinct to cast my votes. There are pro’s and con’s, as always, with this new system. As expected, the predicted “fast” system turned out to be slower than the old system. We cannot blame it though to the system. I watched and timed the PCOS machine when I submitted my ballot, it was fast, it was around 35 seconds before it said “Congratulations!...” Now, some may ask, why then are the lines so long this time? Some had complained standing there since 6 in the morning and just finished at around 8 in the morning. 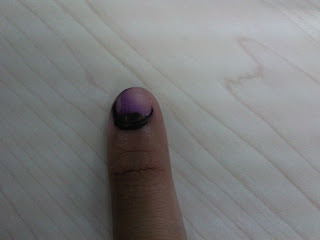 It is because, I think, and this is only in my opinion; there is a need for more COMELEC officials in the precinct. In our place alone, they merged 5 precincts, each with around 180-200 voters, and the officials were just 4. Only one officer hands the ballots and watches/ helps the voters with the PCOS machine. Three of them searches for the names of the voters on the list and applies the indelible ink. It was disaster in that part. But the automated machine was okay, it was fast and according to my cousin who is a poll watcher, is indeed accurate based on their trial votes last night. Despite the flaws, well, it is indeed expected, one that we commonly term as “birth pains”, I am glad that the election pushed through. I have exercised my right (as seen on the photo, but my cousin who’s one of the COMELEC officials in my precinct was so excited to put indelible ink on me, it was too much!) and I am looking forward for a brighter future for the country.